Larissa Another Day: Chores: A Pinteresting Wednesday? Me and the whole "A Pinteresting Saturday" haven't been getting along. The weekend comes and the last thing I want to or am able to do is blog. Ehem...no. I have pinned most of them because I really do have intentions of doing a project, cooking a recipe, using a tip, getting inspiration, etc. You get the idea, I am sure! So A Pinteresting Saturday is probably going to move to Wednesday...any objections? My most recent Pin-tastic projects have a common theme. We are tackling the whole CHORE issue. Our kids have had responsibilities before...but there has been a lack of structure. "If you take out the toys, well then you need to pick them up". Don't get me wrong they eventually did it...most of the time...Still uber tired of saying it. Finally, when I saw THIS, I pinned it and decided to accomplish it post haste. So I went to handy dandy PicMonkey and created myself a fun little label, and wrote my own little poem, for my new toy ransom bucket. I also just typed out a list of different chores/ways they can earn back each toy they left out. I printed everything off. I cut the chores into strips and put them in an envelope. Then I taped the label and the envelope to the lid of the bucket. We have already had our first ransoming. The boys woke up with this bucket FULL...I kid you not...they are still working to get everything back. Thanks to left out toys I have already had my dinning room table and chairs cleaned, the bath toys cleaned, the TV shelf dusted, and I got to watch Oldest run up and down the stairs 10 times (yup some are active things). I have warned my sweet Little Men that if the bucket gets full AND they leave out more stuff, well then that stuff is mine, period. That lit a fire under their fannies! So if you have a similar problem here is my label for you. Save it to your computer then use for your own Toy Ransom Box! Thanks to THIS pin Hubby and I have been discussing our opinions of chores and the whole reward thing. -want to reward them for "extras"
So with the whole "reward them for extras" in mind, I again headed over to PicMonkey and made our Little Men some fun punch cards. 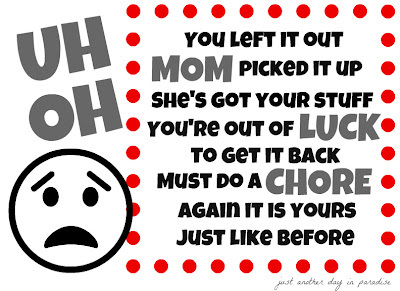 EDIT 08/04/12- I am sorry but I am not longer offering the free download of the chore punch cards. business away from the etsy shop I originally PINNED this idea from. I am glad they got in contact with me and that I could right this wrong. and super cute. Plus they are reasonable. for you to print off. 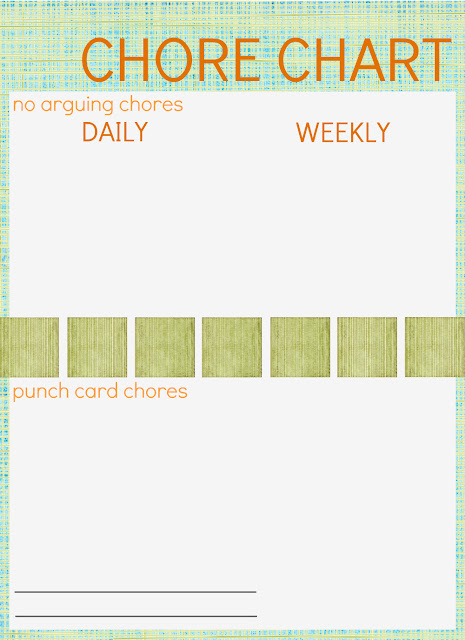 Our rule with the punch cards is that they have to finish their "no arguing" chores. This means they need to finish the chores that are their responsibility period. No reward. Their reward is that they have the most awesomest parents ever and we have provided pretty comfy beds and a whole mess-oh-food they can eat. So once they finish their regular chores, they each have a list of extra things they can do for a punch. Once they fill a punch card they can turn it in for a reward...we have not gotten there yet. There will probably be some adjustment to our Chore hopes and dreams, but for now this is our plan. Wish us luck! I am also giving you the template for the chore chart I used. The original is shown first and then an example of my personalized version is below. You can save the template to your computer. Then in PicMonkey click the "edit a photo" button. Pick this file then go to the text edit and add in your own chores...like I did here. Whew! That was a lot of chore talk. If you are like us and weren't quite so organized yet, or you are just starting out and are looking for chore ideas, I sure hope this helped. I love, love, love this!!! I've been putting off starting formal chores with my girls (3 & 5) because I don't know really where to start or how to implement a plan. This looks like a great place to start, I"m really excited to do this. Thanks for the templates too, they will be great tools. I think that poem is cute. I'll be pinning this post for future needs! Thanks larissa! Very cool and smart!!!!! Once again I am impressed by your creativity. Not only is this super clever and something I so need, I get the Mama Bear reference! My kids are reading the series, I feel so old! I'm so gonna do this! It's so much better than the complicated thing I was gonna try this summer! Mine only had the potential of maybe a week. 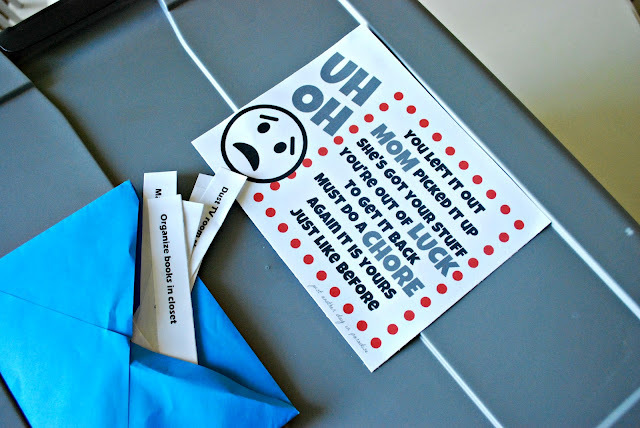 Thank you for sharing these awesome printables! Our kiddos are too young for this now, but the toy ransom box is in our future. Not Just A Mommy- YAY! You got the reference. LOVE that book. I used to envy the finished room when I was younger. Can you say organization geek much? 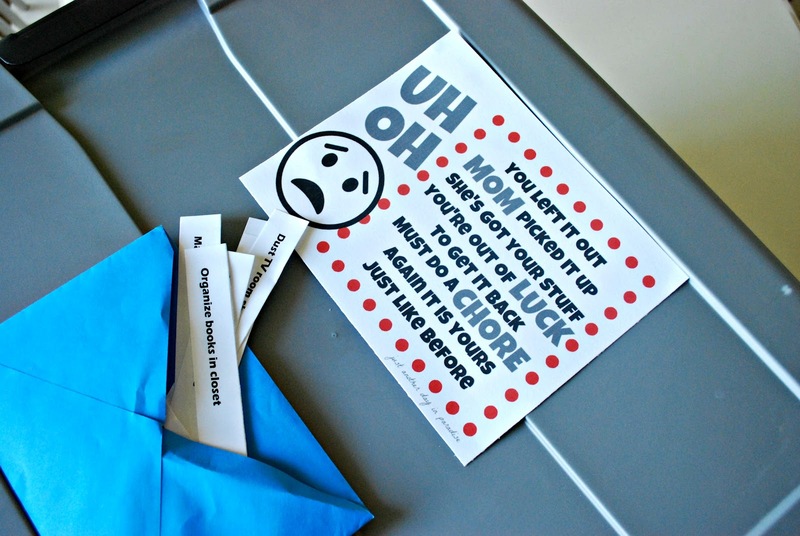 That "Uh Oh" sign is genius. I already printed it out and cannot wait to use it in my house. Brilliant! Definitely get the Mama Bear reference. I've been tempted myself, but I've only gotten as far as bagging and removing to some kind of storage! Wow this is the COOLEST idea! My kids are 12 and 14 and we have been very lax with chores because they are so busy during school. But now it is summer and they have nothing to do but complain if I ask them to do anything. I think it's time to implement chores again and I love the punch cards! I'm thinking a Steak & Shake run will be a great reward! Thanks SO MUCH! I love this!! Thanks SOOO much! I'll make this up now while the kids are still at school and we begin tonight! WooHoo! Glad I got another Mama Bear reference buddy! KIMBERLY! I had no idea I got on Sugardoodle's FB page. It just about made my day! I wanted to let you know that I featured this today in my "What I Bookmarked This Week" post - stop by and see if you have a minute. What do you suggest about an older sibling who loves to "control" her younger sister? Do you think behavior can be added as an infraction? I just need to tell you how awesome you are to create this. Thank you so much for sharing. That is some awesome ideas! Your value system is just the same as mine!! Kids should NOT be just given an allowance... and they should have to pitch in for being part of a family, a team!! Do it while they are young! They should be thankful you are trying to make it fun for them! Wonderful ideas!! You rock! Thanks for sharing! My Oldest is a little guilty of that too. I am sure behavior can be added as an infraction. You could also turn the tables and allow the younger to be in charge. Give Oldest an opportunity to see how it feels. SURE! I will work on getting my chore lists posted. That is brilliant! I am going to try these! How do you use picmonkey. I tried it and can't seem to navigate well. I was going to try making a punch card similar to yours but can't seem to find templates or anything similar. I LOVE IT and so do my 4 kids. I have no affiliation with them but wish I would have thought of it! You create the jobs and the rewards. They can log on whenever they want! loved that idea! my son is napping now so when he wakes up i am going to tell him about it. i already made the chart. thank you! I am a single mom of four kids ages 7,8,9 and 1. I am pro responsibility and have been trying to get my children to realize their are chores even in the summer. Ohhh and the sign.....perfect, i am forever and always picking stuff up. Thank you for sharing this great, awesome, incredible, fantastic idea. Love this! (And yes, I get the Mama Bear reference...I love that book, and I've been there!) :) Thanks for the great ideas! Hee hee...I love that Berenstein's Bear book! (Maybe I relate too much to Mama Bear??) Thanks for the great ideas! I love the chore punch cards! Such a great idea. Would love to see the chores you chose for them to get their toys out of the ransom bucket. I love that so many people get the Mama Bear reference! LOVE. Jessica, I will post that on Saturday! Keep your eyes open for it. Just landed here from PW. 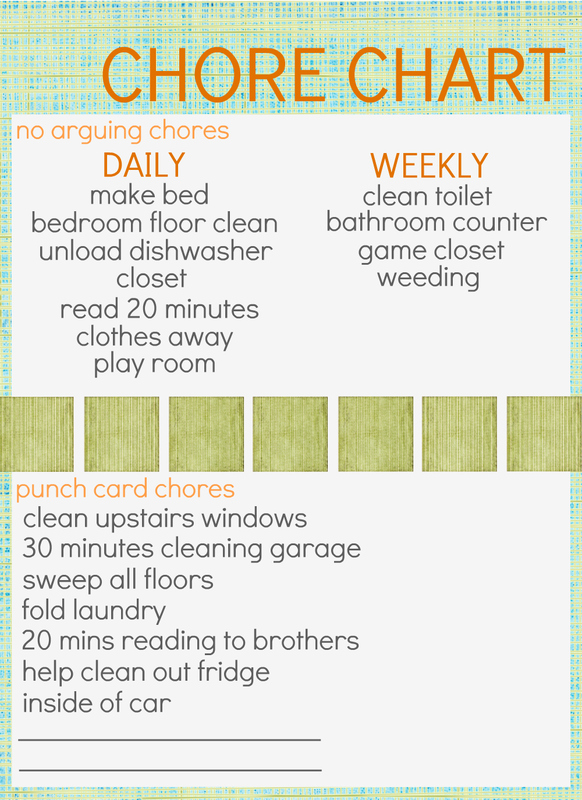 Love this idea we are just now (a little late I might add) chores for our daughter. These are smart ideas! Very cool -- we've started using Accountable Kids again, and your system is similar in some ways. Like -- there are chores that are done because everyone in this family has chores, and there are extra chores you can do to earn money for stuff. I love the "hold the toys ransom for chores" AND several of your ideas for chores never occurred to me! My new favorite is "read 20 min to younger sibling"! Thanks so much! I love the Mama Bear reference and sort of became her yesterday. I gave all my kids a deadline of this Friday afternoon to clean their rooms before I come in to do it. I told them that anything not put away will be either thrown or given away. I think for on-going stuff, I'll do the ransom bucket. Thank you for the printables - I have no time to make up anything cute. PS - My youngest daughter's name is also Larissa. CohoesMom5, a daughter named Larissa!!! Yay for another Larissa out there. Darla, I am so glad you are having fun with it. Thinking up the extra chores are half the fun. My boys' favorite... run around the outside of the house 3 times...who would have thunk it? So funny! That particular Berenstain Bear book just happens to be my favorite, it has been since I was a kid, and I drew a line in my room I shared with my sister, so at least HALF the room would be clean. :) Thanks for the blog post! I am so excited to implement some of those things! I have been looking so hard for your ransom card. I saw it on pinterest this morning which led me to a blog that had posted it but I couldn't find it anywhere. Finally I googled your blog name because I saw in on your printable (thank you) but there were several blogs with the name (sigh) and then...dadadaaa I found you!!! Yay! 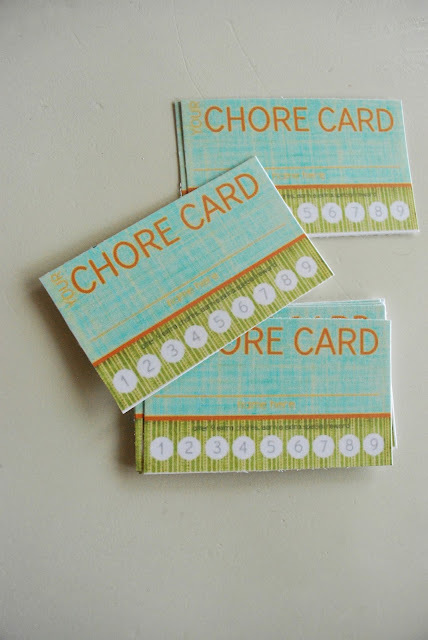 Thank you so much for posting these awesome chore cards. I love the Ransom Box idea. I have been none to grab any toys that were not picked up and put them all in a garbage bag where they stay until they are earned back. I am loving how many people know the Mama Bear reference. LOVE it. I am glad so many of you are able to use and like the chore cards and ransom box. Ours is still working like a charm. I found this through pinterest and LOVE it! I do have a question. I have 3 girls ages 10,8 and 3. I can see the Ransom Bucket turning into-yet another- opportunity to argue and fight about whose it is and who left it out and thus who has to do the chore to get it back. Have you run into that? Any ideas? Carrie, that is a great question. First, when it is something they really want out...they do the chore for it regardless of who's it. Second, when no one cares who's it is and no one cares if it is missing then they are all responsible for doing a chore. Once a week (Fridays for us) everyone is responsible for emptying out the entire bucket. It is pretty much a chorefest! A huge help! Thanks! I'm looking forward to seeing more of your blog! This stuff is so great! I really want to do the ransom box. Love it, but can't figure out how to download it. What am I doing wrong? This is a GREAT idea. Thank you so much!!! Just pinned and facebooked it so expect some more traffic to your amazing blog. I can NOT wait until I have every cup and article of clothing up for ransom. I'm going to have the cleanest house in the neighborhood!!! I love these ideas and am so grateful you shared your templates. I need to finish organizing more of my "stuff" before I can fully implement the ransom idea (or else I may end up with my kids ransoming any of my things that aren't put away and I don't have time to do any more chores lol!). Love the Mama Bear reference...we LOVE those books! They have come in handy many times for teaching a life lesson :) I'm a new follower. Thanks again! Angel Whispers, I know it is tricky. All you need to do is right click on the image and save it as a photo. Then open it up in a Word type document. Hope that helps. MudMom...Thanks for the fb love! I had a "basket" that if the kids left items laying around it would become my until the following Sunday. They would lose it. I love this idea a lot better. I love that they have to earn it back. Thanks so much for posting! My daughter is disabled & she has behavior issues. Her therapist is going to LOVE this! I saw this on Facebook. My friend said she saw it on Pinterest. I did a search on there to see if I could find the blog & I did! OMG YOUR A GENIUS!!!! I will soon be bring this into my home!!!! thank you soo much for sharing this with all of us!!!!! Hi Larissa! I found this on pinterest, and just love it! It was a fun surprise when I found out my old roommate came up with it! We will be implementing this ASAP! I remember vaguely Berenstein Bears. I remember one episode of the cartoon version where the little girl bear bit her nails 'to the quick' - was the first time I had ever heard that expression, so I learned a new phrase. I don't remember the rest of the episode. Jessica!!! So glad you said hi!!! I love this. Thanks for all of the great ideas and printables. My kids are 3 and 5 and we need to start something like this. Hello! I found you via Pinterest. Love your ideas! For the 2nd system with the punchcards, do I just right click to save the images? (I didn't see a place to click to download). Thanks! I am new to Pinterest and this is my very first "view". My father shared this with me.. I have children ages 14, 12, 9, & 5. I LOVE the Momma Berenstein Bear reference as I am a elementary school teacher also. Love those books. I am definately going to try this..!! I need more ideas for the Ransom Bucket and chore list! Katie, yup, just click and save the jpeg to your computer. So exciting to have so many of you from Pinterest. OMG best idea in the world!!!! LOVE IT!!! OMG! Best idea in the world!!! love the chores!! such a life saver! I am wondering if I am missing the link to print the poem out? Can someone tell me where to find and print. I want/need to implement this ASAP!! Thanks for the great idea, tried this a few years back and it flopped, this is a much cuter system!! Tracy, there isn't actually a link. Just right click on the image and save it as an image onto your computer. Then you can print if off using a word type program. I pinned this idea awhile back, but had not yet implemented it. Last night, I fell down the stairs due to a stray toy that one of the kids left laying out. Needless to say, the Ransom Box went into effect today! I'm hoping it teaches them to be more mindful about where they leave their stuff, and at the very least will mean the house is a lot cleaner due to all the chores they'll have to do to earn their stuff back! I think I might need to do one of these for my husband too!! Hopefully it will work!!! That would be funny to include Hubby. Hahaha! Question: Do you do this only at the end of the day, or at certain times throughout the day? And do you tell them to clean up at those times (and then respond according to their follow-through on those instructions), or do you just expect that they will do it without being asked? Yes, I do only do it at the end of the day. Now my boys are still expected to tidy up during the day (well most days), but the end of the day I remind them to clean up everything. If they don't get everything, aka ignore my lovely pleas, then the left over toys go into the bucket. During the Summer I had them clean out the bucket no choices on Friday every week. It has slowed down and now we do it when they want the toy or about every other Saturday. But yes, I will be pushing the children more responsibility. This is a great blog. I love the Cosby Show. It was the best! Totally get the Mama Bear reference and use their books to often bring home a point. Love these ideas! I have a feeling they will be making their way to our home as we start to tackle these issues in 2013! Genius! I saw it originally shared by someone on Facebook, just the picture so I tracked you down. Took me like 30 min to find the original post! But I found you and I pinned the original so people can find you better! Thank you for pinning! AND thank you for searching so hard! Have you ransomed any of your SO's stuff? did you make him do a chore? I really like this idea. I am quite the organized geek, myself; but never could figure out why my girls just weren't ... aren't. They'd just assume have a room you can't walk through, rather than "clean as you go". Then, my eldest (19) surprised me. Off to college she went and all of the sudden the "neat freak" came to town! Oh such hope I have for my 8 year old, now. This definitely gives me some new creative ideas. I love it ... and I totally get the mama bear reference, as well. Actually I had forgotten about it. Thanks for the reminder! I think I will be reading it to my 8 year old. All the ideas which you have mention, are really very grateful the things which you have given are very unique and it can help me in creating new ideas and web designing.. I have tried to save and print the Uh-Oh poem, but it won't let me print it correctly. It gives me some geeky code and not the picture. Is there a link just for the picture for the box? Needed something fun and catchy for the kids and hubby!!!! doing a parenting course at moment which is more about understanding feelings so needed something practical but fun. Thank you for this will give it ago today and if all works out great I will let you know!! !